Are these guys that a team writing “Ryan Flaherty” and “Jonathan Schoop” on the lineup card every day actually has a chance to beat?? Update: I should make clear that this is meant to be apres “Tinkers to Evers to Chance,” by Franklin Pierce Adams. I gave a TED talk! OK, not exactly — I gave a TEDx talk, which is the locally organized, non-branded version, but same idea. 18 minutes or less, somewhat sloganistic, a flavor of self-improvement and inspiration. I was skeptical of the format. 18 minutes! How can you do anything? You can really just say one thing. No opportunity to digress. Since digression is my usual organizational strategy, this was a challenge. And there’s a format. The organizers explained it to me. Not to be hewed to exactly but taken very seriously. A personal vignette, to show you’re a human. A one-sentence takeaway. General positivity. A visual prop is good. The organizers were lovely and gave me lots of good advice when I practiced the talk for them. I was very motivated to deliver it the way they wanted it. And in the end, I found the restrictiveness of the format to be really useful. It’s like a sonnet. Sonnets are, in certain ways, all the same, by force; and yet there’s a wild diversity of sonnets. So too for TED talks. No two of the talks at TEDxMadison were really the same. And none of them was really like Steve’s TED talk (though I did read a poem like Steve) or Amanda Palmer’s TED talk or (thank goodness) like the moleeds TED talk. No room in the talk to play the Housemartins song “Sitting on a Fence,” which plays a key role in the longer version of the argument in How Not To Be Wrong. So here it is now. Life, friends, was boring. xkcd says so. But kids, it’s not true! I was here before there was Internet, and I can tell you, people were not bored more often than they are now, and the boredom was not of a finer and more concentrated quality. The mouse-over text says, in an incredulous tone, “We watched DAYTIME TV. Do you realize how soul-crushing it was?” But people still watch daytime TV! Even though there’s the internet! People like daytime TV. 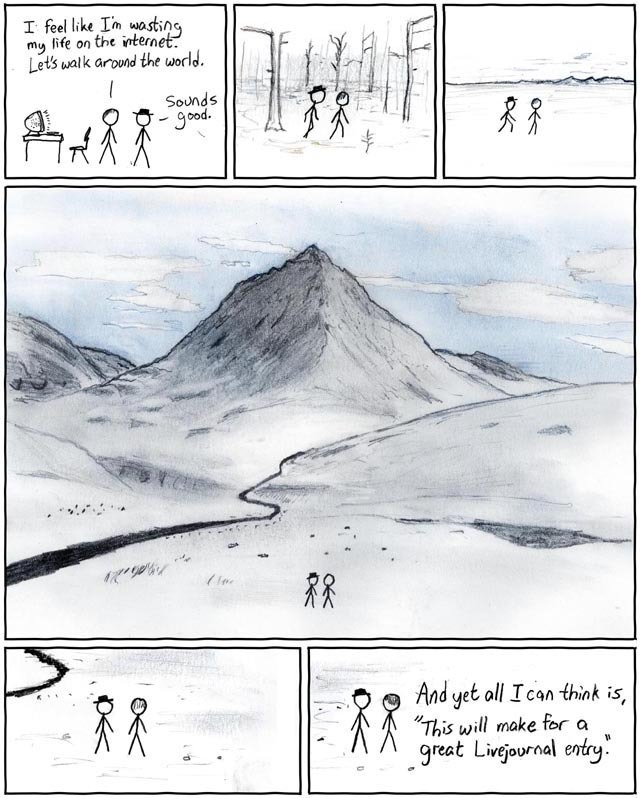 Actually, it’s not clear what stance is being taken here — maybe xkcd really does think nature is of interest only insofar as as it generates ideas for status updates. The right answer is that xkcd doesn’t think anything at all, because xkcd is a comic strip, whose job is to be funny, not to have consistent principled stances concerning how we have lived and what we should do. There’s a post I never get around to making about how much I disagree with something in one of Louis CK’s famous bits, and one reason I never make this post is that it’s kind of dumb to argue with a comedy routine, because comedy routines are not arguments. I got this strange and interesting passage from Smith’s Theory of Moral Sentiments from Mark Lewko’s blog, which seems to be quiet at the moment but I hope it comes back! The beauty of poetry is a matter of such nicety, that a young beginner can scarce ever be certain that he has attained it. Nothing delights him so much, therefore, as the favourable judgments of his friends and of the public; and nothing mortifies him so severely as the contrary. The one establishes, the other shakes, the good opinion which he is anxious to entertain concerning his own performances. Experience and success may in time give him a little more confidence in his own judgment. He is at all times, however, liable to be most severely mortified by the unfavourable judgments of the public. Racine was so disgusted by the indifferent success of his Phaedra, the finest tragedy, perhaps, that is extant in any language, that, though in the vigour of his life, and at the height of his abilities, he resolved to write no more for the stage. That great poet used frequently to tell his son, that the most paltry and impertinent criticism had always given him more pain, than the highest and justest eulogy had ever given him pleasure. The extreme sensibility of Voltaire to the slightest censure of the same kind is well known to every body. The Dunciad of Mr Pope is an everlasting monument of how much the most correct, as well as the most elegant and harmonious of all the English poets, had been hurt by the criticisms of the lowest and most contemptible authors. Gray (who joins to the sublimity of Milton the elegance and harmony of Pope, and to whom nothing is wanting to render him, perhaps, the first poet in the English language, but to have written a little more) is said to have been so much hurt, by a foolish and impertinent parody of two of his finest odes, that he never afterwards attempted any considerable work. Those men of letters who value themselves upon what is called fine writing in prose, approach somewhat to the sensibility of poets. It is not always the same case with poets, or with those who value themselves upon what is called fine writing. They are very apt to divide themselves into a sort of literary factions; each cabal being often avowedly, and almost always secretly, the mortal enemy of the reputation of every other, and employing all the mean arts of intrigue and solicitation to preoccupy the public opinion in favour of the works of its own members, and against those of its enemies and rivals. Now that the public reads no more poetry than it does mathematics, have the moral habits of poets and mathematicians converged? Amazon tells me that somebody has already produced a book of articles on baseball and philosophy, but hasn’t used this gag. I never promised you a unicorn. But still. What is it like to be at bat? Just having T.M.I. tattooed on my balls. run in blood down palace walls. There are no new gags. I think Robbins’s poems are interested in the contemporary fact of there being no new gags. the way that things done for the sake of some eschatological hope or fear end up sort of indistinguishable from normal minor daily habits after enough iterations of the eschatological thing not happening. I have posted “At North Farm” in the blog before, but why not again? Poetry is written to be repeated. Each time I read this there’s something new — this time, the way “sometimes, \\ Sometimes and always” reads as a list of three things, the first two identical. I’m actually not sure how to read this — I think the catalog here is not delineating who “we” are, but rather what we cannot understand and thus do not admire. What makes a baseball fan hard to understand? Maybe this makes more sense in 1924, when the first version of the poem is written, and we’re not so far from the point where the term “fanatic” for a baseball rooter acquired its permanent abbreviation. But why is it hard to understand the bat looking for something to eat? The other animals in the poem are, indeed, engaging in some weird repetitive unparseable motion, but the endless quest for food seems like something we fail to admire precisely because we do understand it. The appearance of the “bat” before baseball is presumably on purpose but I don’t really understand the work it does. Also, the famous phrase from this poem, “Imaginary gardens with real toads in them,” is not so far off as a description of mathematics. Anyway, per BaseballLibrary, Moore was a Dodger fan for most of her life but felt so betrayed by the team’s move to Los Angeles that she switched to the Yankees. Understandable but unforgivable. She’s the baseball equivalent of those people who repent for their youthful liberal overreach by becoming right-wing culture warriors. They make friendship bracelets out of aluminum foil and poison. They open windows just by thinking about opening windows. They take ballet lessons to improve the speed of their circular arm movements. And disorganized thieves and slobs who want to kill us. Preternaturally neat black pajamas—with a hood for cover. The way to tell one ninja from another is by the ankles. The way to tell one ninja from another is you can’t. They know how to levitate by thinking about birds’ feet. They make terrible cater waiters because no one can hear them coming. Bad jazz musicians or art teachers or con men, but they will. They know how to escape from a trap by running in place very, very fast. They can change places with each other by thinking about numbers. They know how to turn themselves into fog to avoid attending boring parties. They make single-serving Lancashire hotpots to show their culinary mastery. Or defenestration. They are pitiless as a swarm of bees, or evolution. They know how to throw fireballs and do their own taxes. They hate litter and small children. They are here to fix us.